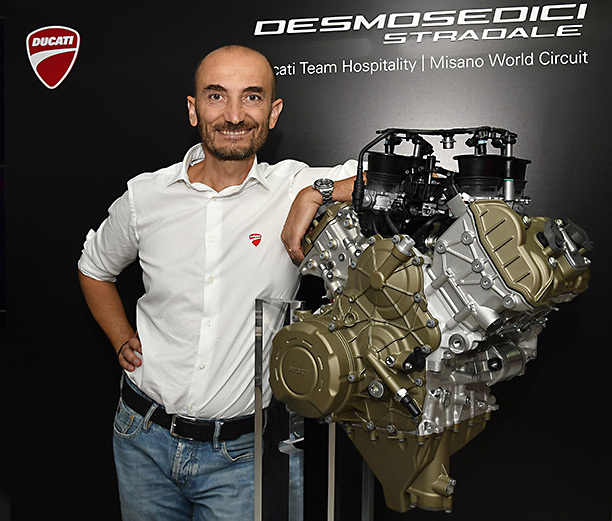 Ducati has unveiled its new Desmosedici Stradale engine – a 90-degree V4 – at the Misano Circuit, Italy, September 8. The new engine will power Ducati’s 2018 Panigale, set to be unveiled at EICMA, November 5. 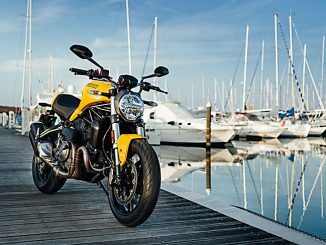 Claudio Domenicali, CEO of Ducati said the engine “represents the start of a new chapter” for the company. Ducati press material says the Desmosedici Stradale engine is “undoubtedly” suited to the track, but it has also been designed to respond to the needs of the road rider. These needs can vary significantly, so let’s take a look at the new donk. The road-going Stradale will be slightly larger in capacity (1103cc) than and R spec engine (expected in 2019), which will have to be under 1000cc to comply with World Superbike homologation rules. This should give the 1103cc variant a bit more usability in the low to mid rev range for your average rider, but it will more than likely be down on overall hp to the expected R variant. Not that it matters, because output is expected to exceed 210 horsepower, with maximum torque exceeding 120 Newton-metres from 8,750-12,250 revs. The V4 will use a counter-rotating crankshaft like what Ducati uses in its MotoGP engine to reduce the gyroscopic effect and provide agility. The crank pins are offset at 70 degrees, involving a Twin Pulse firing sequence to provides grip in corner exits, known more commonly as the ‘Big Bang’ effect. The change to a 90-degree V4 also allows for mass centralisation, the engine will be tilted slightly forward, optimising weight distribution, whilst allowing for larger radiators and bringing the swingarm pivot point forward. 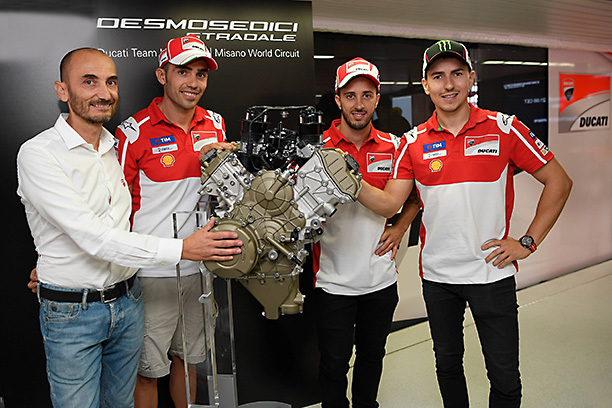 The cylinder bore is the same spec as the Desmosedici GP, Ducati’s MotoGP engine, at 81mm. The Stradale is expected to be almost identical with in-engine fluid dynamics. Variable height air intake horns are a first for a retail Ducati, claimed to optimise cylinder intake across the rev range. Fuelling will be taken care of by oval throttle bodies, each with two injectors, one each side of the butterfly. 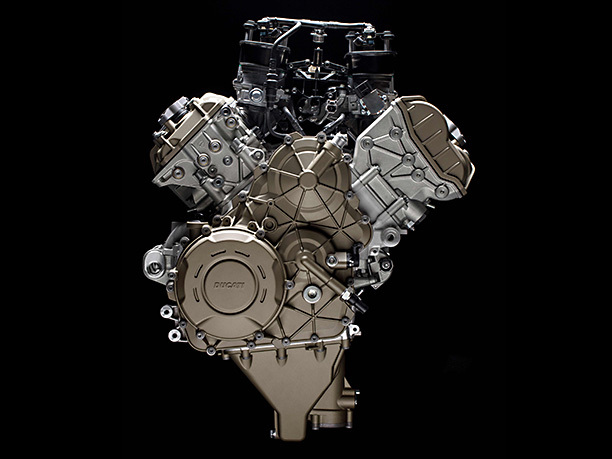 We will also see Ducati’s continuation with the Desmodromic valve system.